According to its own budgetary update, in 2018 the Palestinian Authority spent no less than 502 million shekels on salaries and other payments to terrorist prisoners and released terrorist prisoners. While the PA does not provide information how the 502 million shekels was allocated between the terrorist prisoners and the released terrorist prisoners, using open sources only, Palestinian Media Watch has calculated, subject to a number of limitations, these figures. Using information obtained from the Israeli Prison Service (IPS), PMW has calculated that the Palestinian Authority paid at least 230 million shekels in salary payments to terrorist prisoners in 2018. For example, based on the information provided by the IPS that appears in the 2 left hand columns in the chart below ("time served" and "number of prisoners") and the PA's own terrorist prisoner pay scale ("salary" column), PMW has calculated that in the month of January 2018 alone the PA paid almost 20 million shekels in salaries to the terrorist prisoners. 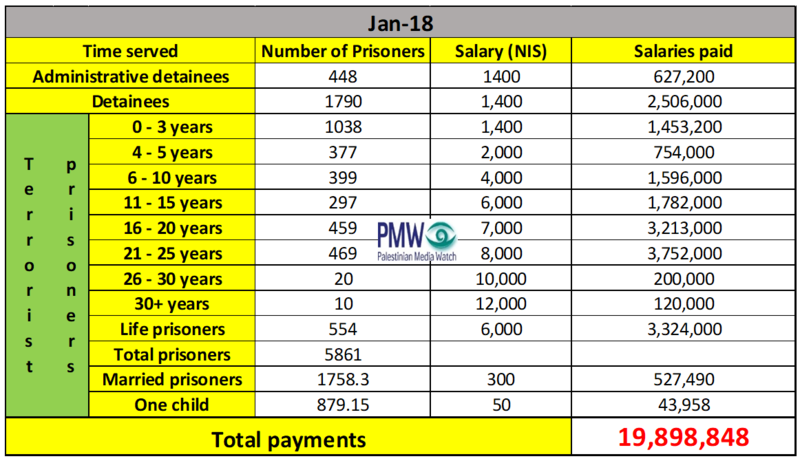 Additional figures calculated by PMW show that the PA also paid no less than 176 million shekels in salaries to released terrorist prisoners in 2018. It is important to note that the figures compiled by PMW rely entirely on unclassified and public sources and are subject to the limitations of the statistics received from the IPS. For example, prisoners who were members of the Palestinian security services when arrested and who received a higher salary than the salary the PA pays terrorist prisoners, continue to receive the higher salary in prison. The PA pays these terrorist prisoners from a different budget. PMW has no way of confirming how many of the terrorist prisoners belong to this category. In addition, PMW's calculations are based on the current length of prison time served by each prisoner. Under PA law, prisoners with prior arrests will be receiving a higher salary from the first day of their later arrests, according to the total time served already. PMW has no way of confirming how many of the terrorist prisoners belong to this category. Additionally, the IPS was unable to provide exact statistics how many terrorist prisoners have spent more than 20 years in prison or how long each of the terrorist prisoners serving life sentences have already spent in prison. The limitations of the IPS statistics required PMW to make a number of lenient assumptions - based on PA and pro-Palestinian NGO sources - regarding the number of prisoners who have been in prison for 25 - 30 years and over 30 years. Similarly, while the IPS did confirm that at least 486 terrorist prisoners serving life sentences have been in prison for over 10 years, the IPS was unable to provide further clarification. Accordingly, while there are definitely terrorist prisoners sentenced to life sentences who have spent more than 15 years in prison, which would entitle them to a higher salary, PMW attributed all the prisoners serving life sentences with a salary of only 6,000 shekels per month. It should be noted that these figures refer only to the salaries paid by the PA to the terrorist prisoners and the released terrorist prisoners, and do not include all the different other financial benefits the PA grants them. In July 2018, Israel's parliament passed legislation to financially penalize the PA for its terror reward payments. According to the law, Israel's Minister of Defense must compile an annual report of the PA's payments to the terrorist prisoners, released terrorist prisoners, and the so-called "Martyrs" and wounded. Once approved by the Security Cabinet, the Israeli Government will deduct the amount the PA spent to incentivize and reward terrorists from the taxes Israel collects and transfers to the PA. Since the first such report is due to be submitted in the coming days, PMW has provided the Ministry of Defense with its calculations for the monthly and annual PA expenditure on the salaries to the terrorist prisoners and released terrorist prisoners. Needless to say, the above limitations, and others, on the information provided to PMW, resulted in calculations much lower than the PA's actual payments to terrorist prisoners and released terrorist prisoners. These limitations would not apply to the Israeli government which should be able to get the comprehensive information necessary to calculate the full PA expenditure on salaries and benefits to the terrorist prisoners and released terrorist prisoners. Finally, it should be stressed, that these PMW calculations refer only to the PA payments to terrorist prisoners and released terrorist prisoners, and do not include the PA payments to the families of dead terrorists, the "Martyrs." The PA budget for the terrorist "Martyrs" is listed under the same budget category as the wounded and those civilians who have been killed but were not involved in terror. The 2018 PA budget allocated 687 million shekels for all these. 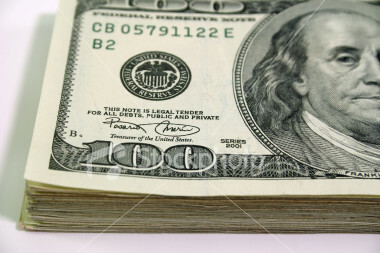 Under Israeli law, the amount the PA spent on the terrorist "Martyrs" and wounded involved in terror must also be deducted from the money Israel collects and transfers to the PA. At this point, PMW does not have a comprehensive report on the amounts paid by the PA to the families of the terrorist Martyrs or to the wounded terrorists.